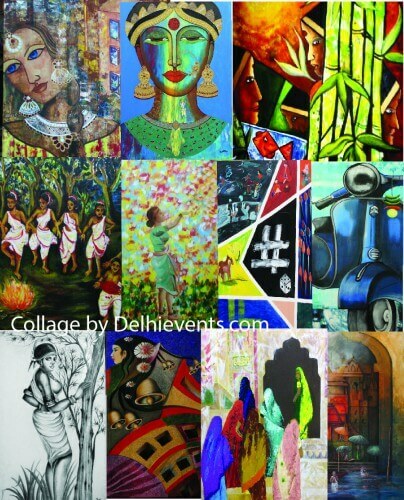 The event will also have the gracious presence of Mrs Anita Makkar, Education Leader and Principal HDFC School, Gurugram and Mrs Aparna Erry, Principal DAV School, Gurugram who would be launching awe-inspiring Coffee Table Book (CTB) on eminent Dr Sunil Jaiswal’s artworks, conceptualised and designed by Takhte team. Dr Sunil Jaiswal holds 25 years of experience in visual arts and has honed his skills in the creation of images objects in media including painting, charcoal, sculpture, mural and frescoes. He has won famous awards, which includes ‘All India Fine Art & Craft Society-2010’ and ‘Delhi College of Art’ First Prize winner for all four years-1994-1997. He has held various solo and group exhibitions all over the country as well as overseas. His credentials include the artwork has been picked by President House and hotels and corporate like Radisson, Vedanta, Eros Continental, Palm Court etc. In the mentioned exhibition, the participating artists, 11 in number from Lakhya Institute of Art under the mentorship of Dr Sunil Jaiswal will exhibit a variety of artworks from a liberal art world. Bhawna Chauhan, Art & Craft Facilitator with Sri Ram Global School, Gurugram, who loves to explore creativity in growing children and teaches art in storytelling format will exhibit her works ‘Intezaar’ on a lady who is smilingly waiting for fortunes to arrive. Madhvi Sharma, Language Teacher in French with D.P.S.G., Gurugram, living her passion for paintings will showcase her works on ‘Closeness to nature’, a universal power leading to self-realisation. Pooja Kathuria trained commercial artist and exceedingly influenced by Rajputana culture and customs will showcase her works on ‘Women’s assiduous life enwrapped with simplicity’. Preeti Gupta, professional Interior Designer and founder of allaboutpaintings.com will showcase her works on ‘Vintage Vehicles’ carrying catchy slogans as art is fun for her. Ruchika Choudhary, a homemaker and professionally qualified has innovatively used Mehendi and colours in her paintings, on the theme ‘Maa Lakshmi’ symbolising richness and prosperity. Shanivi Sadana, dedicated and passionate artist, whose painting from ‘Malta Series’ has been selected in World Art Dubai will exhibit her artworks on ‘Temple Within,’ i.e. to find the God within oneself. Vibhavari Ahluwalia, Art Teacher with D.P.S.G., Gurugram, who is since 20 years in this profession and assertively believes in having the basics clear and love to explore child-art, will showcase her works on ‘Feng Shui’ items symbol of peace, harmony and tranquillity. In addition to this Chetna Sharma, Meenu Singh, Rimpi Gupta and Sutapa Bose will also be exhibiting their artworks.